The Prophecy is a well-crafted religious thriller with a number of standout performances by its cast. Any horror movie that spawns a whole franchise of sequels has to have something going for it, and this one revolves around a war in Heaven between factions of angels. Like a number of successful horror films before it, the story is heavily grounded in Catholic beliefs and plays off that history to add emotional resonance to the main action. Echo Bridge has only included the original American theatrical version on this multi-pack, as a European cut that is slightly different also exists. The main feature runs 97 minutes. Thomas Dagget (played convincingly by Elias Koteas) is a homicide detective who left the Catholic Church as a priest, after suffering horrible visions of the brewing war between the angels. Questioning his faith, Dagget meets a mysterious man named Simon (Eric Stoltz) claiming to be an angel. Simon reveals a prophecy foretelling of a second war in Heaven between the angels, with one special soul on Earth being the key to victory for either side. It sounds hokey at first blush but works much better in the context of the movie. As the mystery slowly and logically unfolds, the viewer gets drawn into the world of Thomas Dagget. A series of plot developments lead us to the Archangel Gabriel, leader of the rebel faction of angels. 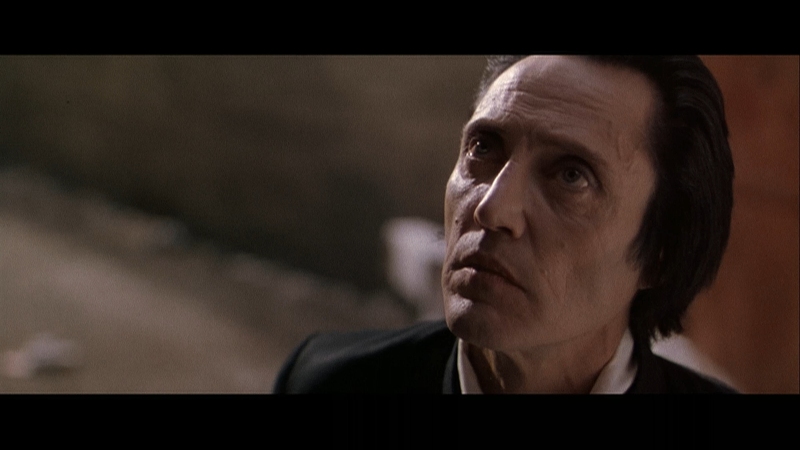 Gabriel is played in a deliciously over-the-top performance by Christopher Walken, reveling in the character’s utter contempt for humanity. Apparently Gabriel is upset that God favors humanity over the angels and wants to change that now, by attempting to take over Heaven from the current regime of angels favoring the status quo. He needs the most evil soul on Earth as a weapon to succeed but Simon has craftily hidden the soul in a small child. From there it’s a struggle between Gabriel and his minions against Thomas Dagget. Virginia Madsen comes along for the ride as the schoolteacher for the small child, but it’s a minor part that has little impact on the main story and feels thrown in to add a female lead. The Prophecy has crisp dialog and the very strong cast give this genre thriller an added quality few B-movies possess. Aside from Walken in his memorable role, Viggo Mortensen has a small but vital role as Lucifer that electrifies the movie when he’s on screen. Horror fans that like a bit of Christian esoterica mixed into their films will love The Prophecy. The transfer is inconsistent and problematic at best for a movie that was first released in 1995. Presented in its native aspect ratio of 2.35:1 in the multi-pack, The Prophecy is encoded in AVC at very low bitrates, as it shares a single BD-50 with three sequels. That choice leads to a number of compression problems, from macroblocking in darker scenes to regular bouts of chroma noise. It’s not the worst compression effort on the Blu-ray format, but it’s far from ideal and could have been easily improved. The transfer itself looks quite dated, likely from an older scan of questionable film elements. It has a number of rough patches, from negative specks to visible debris on the print. While close-ups occasionally look decent in brightly lit exterior shots, visible resolution is far below what we’ve come to expect from 35mm film in 1080p. The Prophecy was not a low-budget production for a horror movie of its vintage. A fresh 2K scan of the camera negative would produce vastly superior results over this disc. The BD is still a minor increase in resolution over the ancient non-anamorphic DVD, but casual fans will constantly be wondering if this presentation is truly in HD. As for the picture itself, The Prophecy is a dark movie where the black levels are nearly always on the verge of being crushed. Shadow detail gets reduced to nothing on occasion, obliterating some of the action in the darkest scenes. Christopher Walken’s hair might as well be a sheet of black coal, as it’s very difficult to discern any sort of delineation to it. The BD does appear film-like and unmolested by digital filtering. There is not a hint of grain reduction or edge enhancement to the image. Only occasionally does the film become sharp with vivid definition, most of the time it’s a soft and muddled affair. This disc is not likely to satisfy the movie’s fan-base for video quality in HD, though it will have to do for the moment. Note: Solely reviewed here is the version off the The Prophecy Collection multipack by Echo Bridge, a collection of four films from the Prophecy franchise. Echo Bridge has provided a decent, if unspectacular, 5.1 DTS-HD MA soundtrack for The Prophecy. The lossless sound is fairly typical for a 1995 Hollywood production, with a moderate amount of surround usage. Dialog is a bit tough to understand at times, as some of the lines are whispered very low in volume, but in general the fidelity and clarity are perfectly acceptable. The movie was originally mixed in ultra-stereo for theatrical release and the original Buena Vista DVD only included a 2.0 Dolby Digital soundtrack, so this BD is a clear upgrade in that regard. While not completely lacking a presence in the LFE channel, the subwoofer only gets a marginal workout in select scenes. There are a few panning effects across the room as Gabriel shows up at the morgue, though the mix becomes liveliest during the hellacious visions of carnage among the angels. If one goes in with low expectations, the soundtrack should not disappoint fans. Echo Bridge has neglected to include subtitles of any kind. Echo Bridge has failed to provide any extra features for The Prophecy, discounting the presence of the three included sequels in this multi-pack.